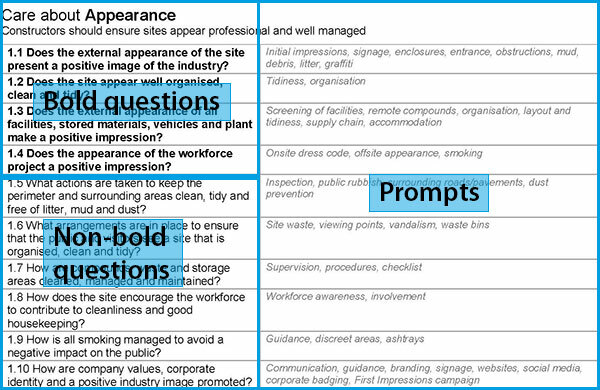 The Scheme’s Monitors’ Checklist is used by the Scheme’s Monitors to assess the performance of registered sites. The Checklist supports the Code of Considerate Practice and asks a number of questions to establish what level a site is performing to. Like the Code, it is made up of five sections with ten questions in each section. The four bold, closed questions are aligned to the four bullet points of the Code, and allow the Monitor to establish whether the site or company has achieved compliance with the Scheme. The six non-bold, open questions directly support the bold questions by asking ‘what’ is being done and ‘how’ things are being addressed to meet and exceed the required standards. The Code of Considerate Practice details the Scheme’s requirements and the Checklist’s bold questions establish if a site is meeting these requirements. 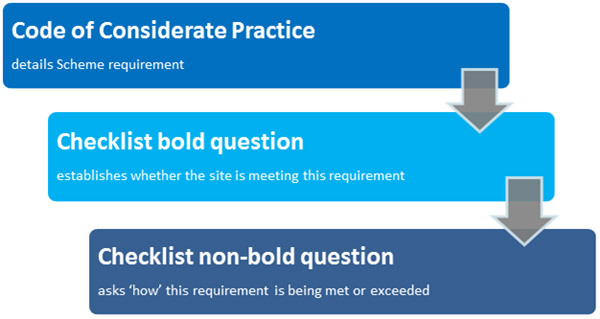 The Checklist’s non-bold questions then ask ‘how’ these requirements are being met or exceeded. Does the external appearance of the site present a positive image of the industry? What actions are taken to keep the perimeter and surrounding areas clean, tidy and free of litter, mud and dust? Each question in the Checklist is now supported by a number of ‘prompts’ and these indicate specific items the Monitor may consider when establishing whether the site has met the expectations of that Checklist question. It is important to note that this list of prompts is not exhaustive and inevitably other items will need to be considered. It is important to understand that the prompts as just that – prompts. They are on the Checklist to indicate the kind of issues that the Monitor will be looking at within that question, but they are not a ‘sub checklist of requirements’. Some will apply on all sites while others won’t – it is down to the Monitor to look at the size, type and location of the site, and use his or her judgement to decide what is expected. The prompts can also be used by site managers to understand the questions but, as above, the list is not exhaustive and simply addressing each prompt will not necessarily provide a high score. We expect sites to use their initiative to decide what they can and should do to achieve the expectations of the Scheme. Monitors will use their discretion when assessing whether questions or prompts are relevant. Where they are not, they will not be considered when assessing performance or awarding a score. Monitors will decide whether a question has been adequately addressed taking into account the size, type and location of the site, as well as the context of the project. Credit will not be given for activities that are planned but have yet to be carried out. The additional questions detailed on the final page of the Checklist are for data gathering purposes only and the responses to these questions will have no impact upon the score awarded.